comment Buy your ticket now and save up to 34% versus the gate price! Real Disneyland® Paris ticket - with your ticket in hand, skip past the ticket lines, scan at the gate and go straight into the parks with minimum hassle! Access to your choice of either Disneyland® Park or Walt Disney Studios® Park. Buy your ticket now and save up to 34% versus the gate price! Dreams come true at Disneyland® Paris with a 1-Day/1 Park Disneyland® Paris Ticket. Perfect for those with limited time in Paris, this ticket gives you a full day at your choice of either Disneyland® Park or Walt Disney Studios® Park. ADDED BONUS: Plus this summer, adults can enjoy the magic of Disney for the same price as kids! The offer is valid for visits between 8 June and 10 October 2018. There is a choice of 1-Day/1 Park Disneyland® Paris Tickets. Choose between tickets with date restrictions and those valid all year. 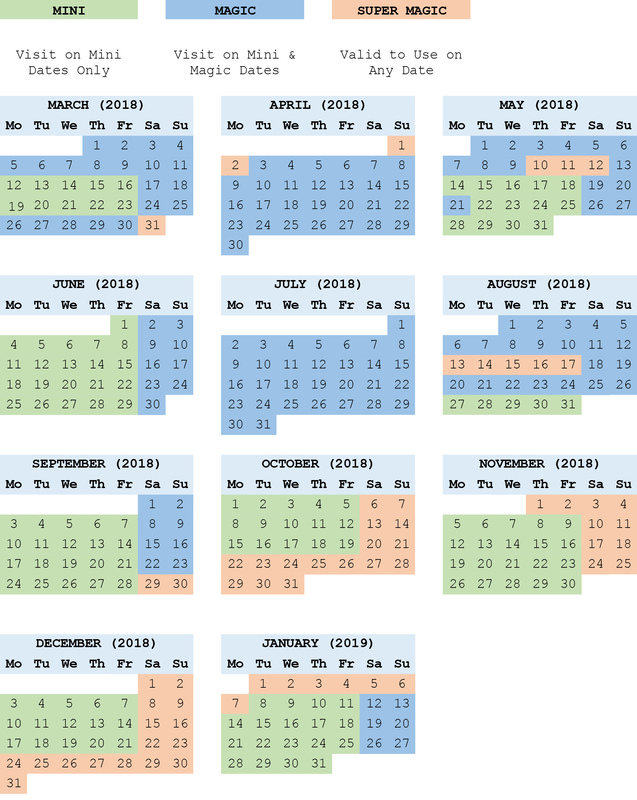 Our 1-Day/1 Park Disneyland® Paris Tickets are open-dated and can be used on any day within the valid season dates highlighted below. MINI TICKET (LOW SEASON): MINI Tickets represent the best value for money, but can only be used on MINI Season dates listed. These tickets cannot be used at any other time. MAGIC TICKET (HIGH SEASON): The Magic Ticket is valid for all of the MINI Season dates listed below as well as more popular MAGIC DATES. These include some school holiday dates and weekends, giving you more choice when to visit Disneyland® Paris. SUPER MAGIC (PEAK SEASON): The most flexible Disneyland® Paris 1 Day/1 Park Ticket. The Super Magic Plus Ticket is perfect if you are unsure when you wish to visit Disney Paris as it can be used on any day throughout the year including the most popular dates such as Halloween, October Half Term, weekends in November and December and Christmas. 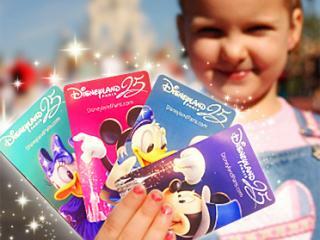 The 1-Day/1 Park Disneyland® Paris Ticket also includes the fantastic Standard FASTPASS® system, a free, time-saving service that shortens your wait at the most popular attractions in Disneyland® Park and Walt Disney Studios® Park. Disneyland® Paris is just 35 minutes from central Paris by train – take the RER line A4 Marne la Vallée/Chessy station, 100 metres from the gates of Disneyland Park. From the moment your foot (or glass slipper) hits the cobbles of Main Street, you're officially dreaming with your eyes open. Here you'll explore five themed Lands filled with Disney classic stories. In a magical kingdom called Disneyland® Park. You'll find fun and laughter with Disney friends around every corner! For big thrills, head to Space Mountain: Mission 2 for a space-ride that blasts you off to the edge of the universe or tackle a perilous runaway mine train on Big Thunder Mountain. The whole family can become a spaceranger and save the toys on Buzz Lightyear Laser Blast® and little ones are sure to remember the fantasy flight to Neverland with the Lost Boys on Peter Pan's Flight. Don't miss a meet 'n' greet with beloved Disney Characters or Disney Dreams®, an enormous night-time spectacular extravaganza of lights, colours, lasers and fountains. Right next door to Disneyland® Park, discover the magical world of cinema and television at Walt Disney Studios® Park. Step through the Studio Gates and let your imagination soar. Time to immerse yourself in the never-ending, always-fascinating world of movies, animation and television. There are some spectacular surprises starting with The Twilight Zone Tower of Terror™ where the drop that is faster than the speed of gravity. For a pumping ride with all the G-Force, jump on the Rock 'n' Roller Coaster starring Aerosmith or tackle Crush's Coaster4, the wild, wide-eyed ride through the wonders and dangers of ocean life. Experience Stitch Live, a first-of-its-kind real-time interactive animated experience the kids will love or get your engines revving on the crazy spin-out Cars Race Rally. Disney's Stars 'n' Cars cavalcade is a party on wheels you don't want to miss! Your 1-Day/1 Park Disneyland® Paris Ticket will be mailed to you in the post. Upon arrival at Disneyland Paris, simply scan the barcode at the gate for admission to the park of your choice. MINI and MAGIC Tickets have date restrictions and can only be used on one of the dates listed in the description. If you visit on a date that your ticket is not valid, you will need to pay the difference to upgrade your ticket in order to enter the park. Please see ticket description for valid dates. Ticket inclusions are exactly the same for all the Disneyland® Paris 1 Day/1 Park Ticket types. The only difference between the tickets are the dates they can be used to enter the Disneyland® Paris parks. All Disneyland® Paris Tickets include the fantastic Standard FASTPASS®, a free, time-saving service that shortens your wait at the most popular attractions in Disneyland® Park and Walt Disney Studios® Park. The Standard FASTPASS® is operated on a rolling basis so you can only ever have one Standard FASTPASS® at a time. This is done in the park and cannot be done in advance. To get your Standard FASTPASS®, approach the ride you would like and you will see a Standard FASTPASS® kiosk if the ride participates in fast passes– normally next to the main queue. There will be a time displayed above the kiosk and this indicates the time you can return to join the Standard FASTPASS® queue. You need to scan your tickets at the ticket machine and you will be given a Standard FASTPASS® ticket. You then return to the Standard FASTPASS® queue at the time indicated. Standard Fast passes are subject to availability. Height and age restrictions apply on certain rides. Parks, attractions or entertainment may change operating hours, close due to refurbishing, capacity, weather, or special events, and may otherwise change or be discontinued without notice and without liability. These tickets do not include Special Events and are not valid for use to access Disney's® Halloween Party or New Year's Eve at Disneyland® Paris, these are separately ticketed events. Can I only visit Disneyland® Paris on the date I select at the time of booking? No, 1-Day/1 Park Disneyland® Paris Tickets are open-dated and can be used on any day within the valid season dates listed in the description. What happens if my plans change and I have already a purchased a 1-Day/1 Park Disneyland® Paris Ticket that is not valid for my new planned visit date? Provided your ticket has not be used or defaced in any way, your tickets are fully changeable/refundable. Simply return your tickets and we can amend your booking for tickets that are valid for the date you are visiting. You will need to pay the difference in price if you are changing your visit to a high or peak season date. Similarly we will refund the difference if you are changing your visit to a low season date. Are the ticket inclusions different for the Mini, Magic, Super Magic and Super Magic Plus Tickets? No, the ticket inclusions are exactly the same for all the Disneyland® Paris 1 Day/1 Park Ticket types. The only difference between the tickets are the dates they can be used to enter Disneyland® Paris parks. Attraction Tickets Direct act as retail agent for Disneyland Paris. The theme park’s terms and conditions will apply to your booking as well as our own. To view the theme park’s terms and conditions click here. To view our full terms and conditions please click on the link at the bottom of the page.